Eddie & Wolfgang Van Halen’s Chemistry Is Off The Charts In This Amazing Live Performance! They Play Off Of Each Other So Well! 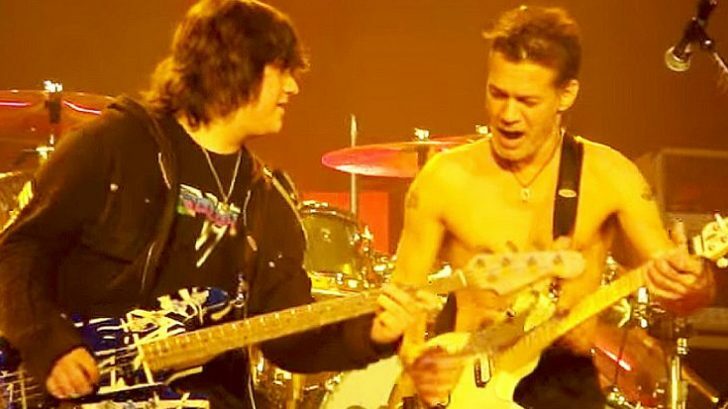 Many fans of Van Halen will say that the band will never truly be the same without the talents of Michael Anthony, and while that may be true, you can’t say the band isn’t awesome with the addition of Eddie Van Halen’s son Wolfgang. He’s a musician forged from birth by the guitar master as his father; what more could you ask for? Not only is he the son of Eddie Van Halen, but also he has proven to be more than able to hold his own on stage. He is a phenomenal musician in his own right and has truly stepped out of his father’s shadow. With that said, if you’ve ever seen them live, you’ll know just how amazing their chemistry is. Here’s the proof! What you’re about to watch is a video in which Van Halen takes the stage in San Diego back in 2007 and performs “Runnin’ With The Devil”. While the rest of the band puts on a good show, Eddie and Wolfgang steal the show with their amazing chemistry. See for yourself!